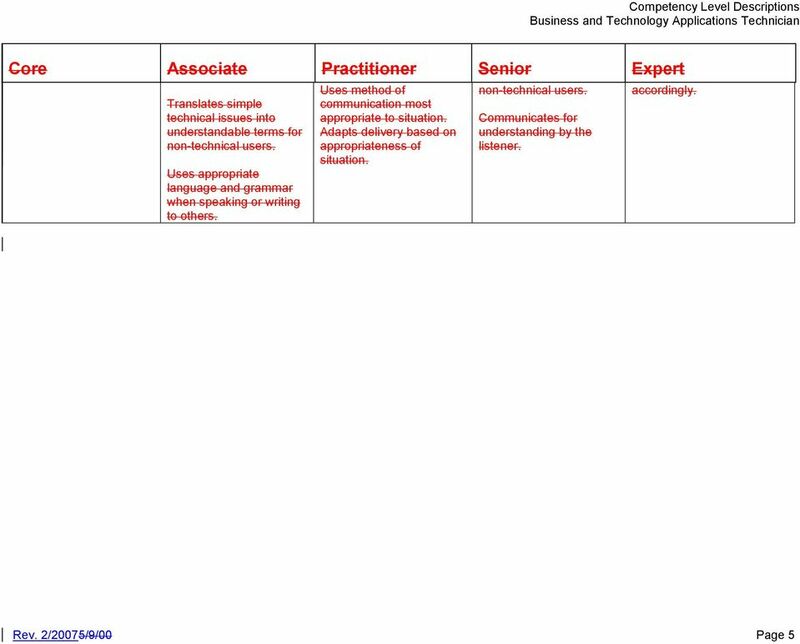 Download "Business & Technology Applications Analyst"
5 NC OSP 6/2004 Business & Technology Applications Specialist DESCRIPTION OF WORK: This is specialized work in creating, implementing and maintaining technical application solutions or applying appropriate technology to projects of a broad organizational scope (e.g., large/complex department, college, university-wide, agency wide, or statewide). Projects solutions may be in the area of business, research and/or instructional applications. Employees research technological changes to determine the impact and integration with existing standards and architecture of applications. 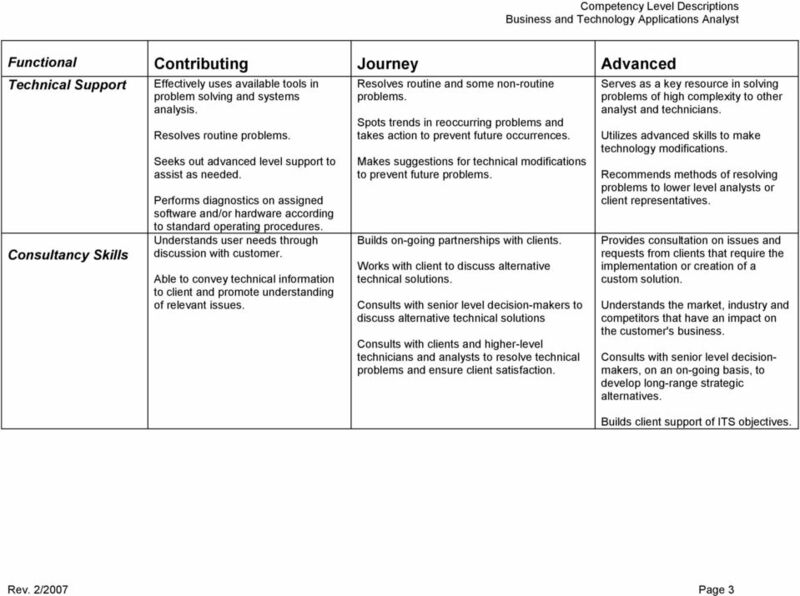 Assesses customer needs and develops technical solutions, especially as these solutions involve integration of multiple systems and applications. 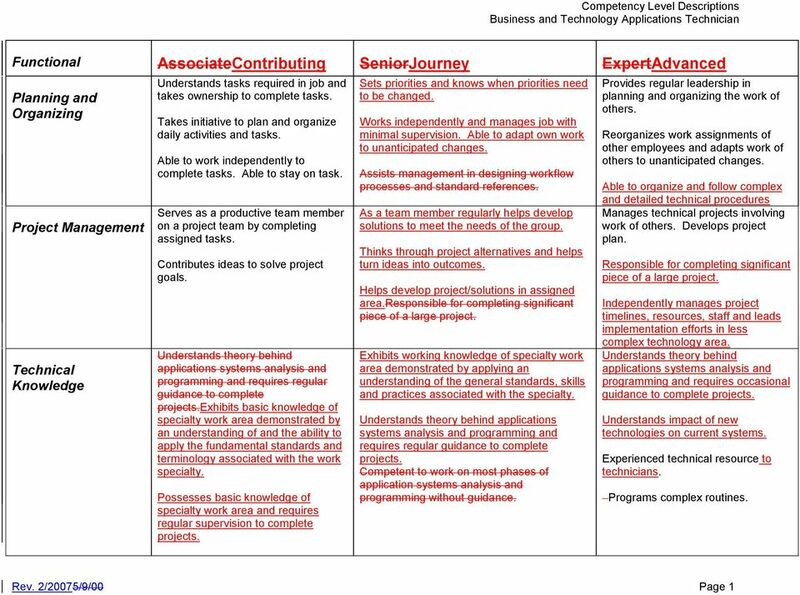 Typically, employees are specialists in a software, tool or standard and serves as a resource to other applications development staff in the organization. 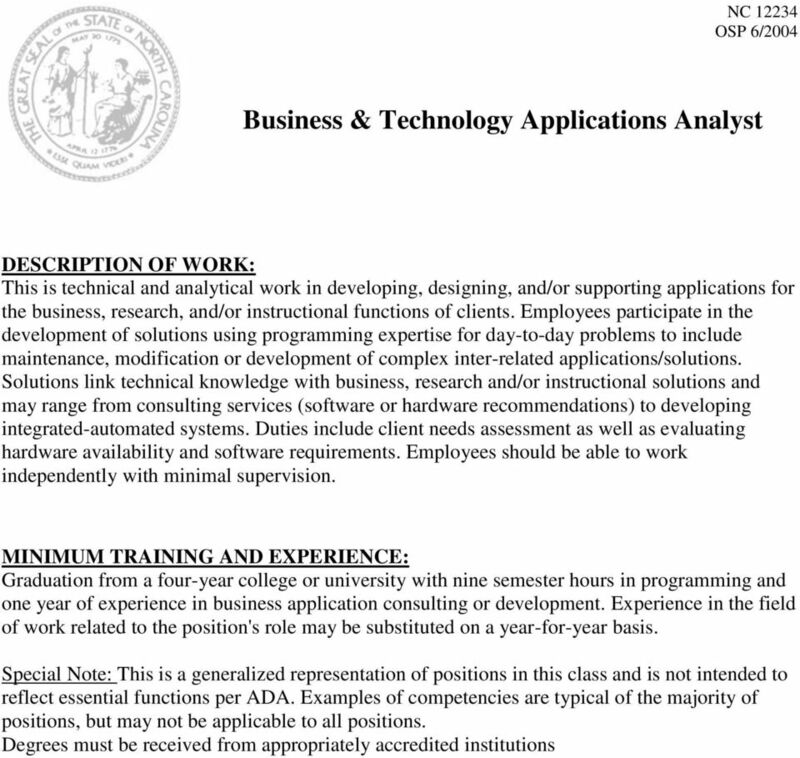 MINIMUM TRAINING AND EXPERIENCE: Graduation from a four-year college or university with nine semester hours in programming and three years of experience in business applications consulting or development. Experience in the field of work related to the position's role may be substituted on a year-for-year basis. Special Note: This is a generalized representation of positions in this class and is not intended to reflect essential functions per ADA. 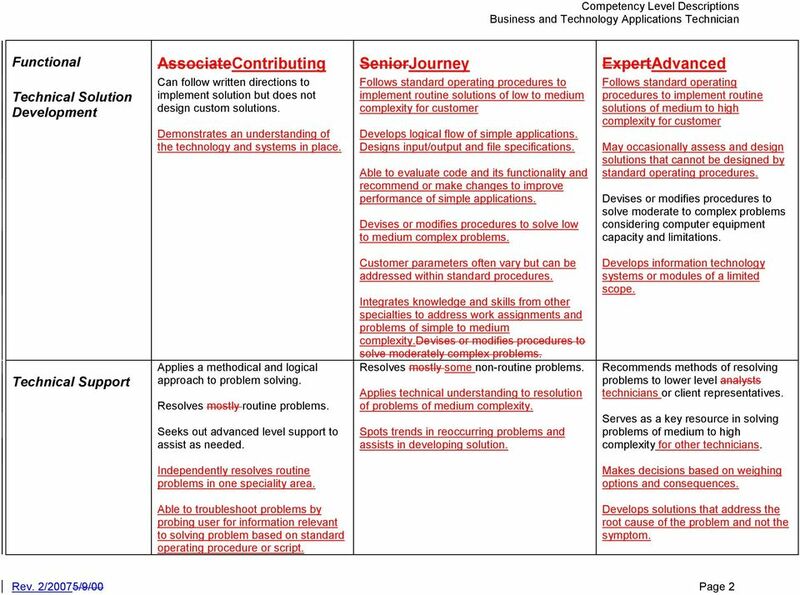 Examples of competencies are typical of the majority of positions, but may not be applicable to all positions. Degrees must be received from appropriately accredited institutions. 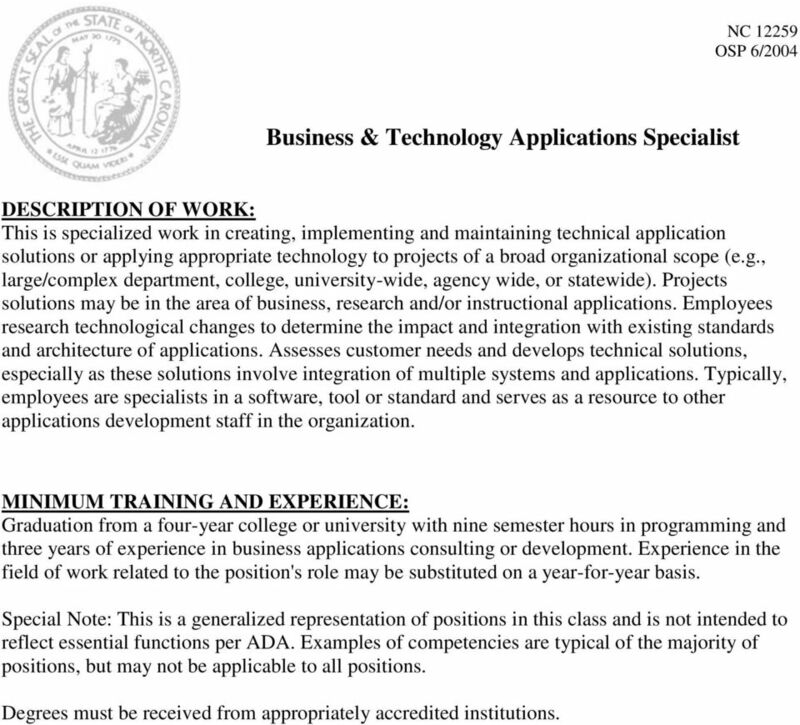 17 NC OSP 8/1/2006 Information Technology Executive Description of Work: This is Senior level management at the Office of Information Technology Services (ITS) or the top one or two technology jobs in an agency with a large complex technology organization. 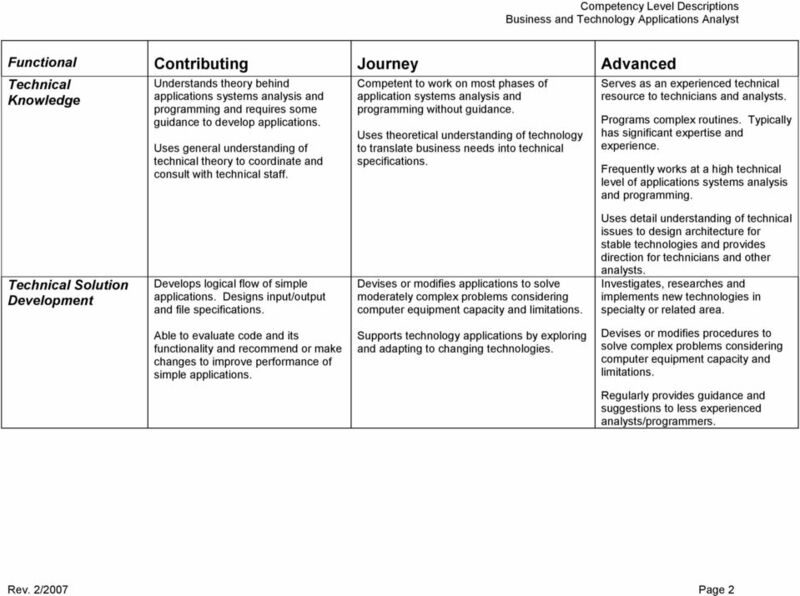 Scope of the technology operation is statewide. May be responsible for several functional areas within Information Technology or a large, complex area with related sections. May serve as Chief Technology Officer or Deputy CIO in a large complex technology organization responsible for the day-to-day operations of all IT activities. Provides strategic vision to move the organization forward. 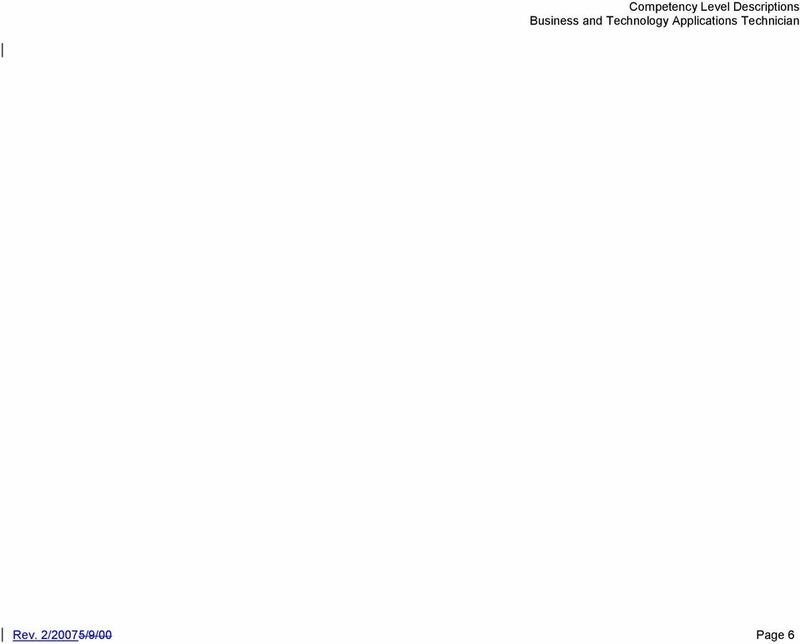 Responsible for defining the structure of the business plan and ongoing management for Information Technology. Reports directly to the State CIO or Deputy State CIO at ITS. Reports directly to an Agency Head or Deputy Agency Head at an agency. 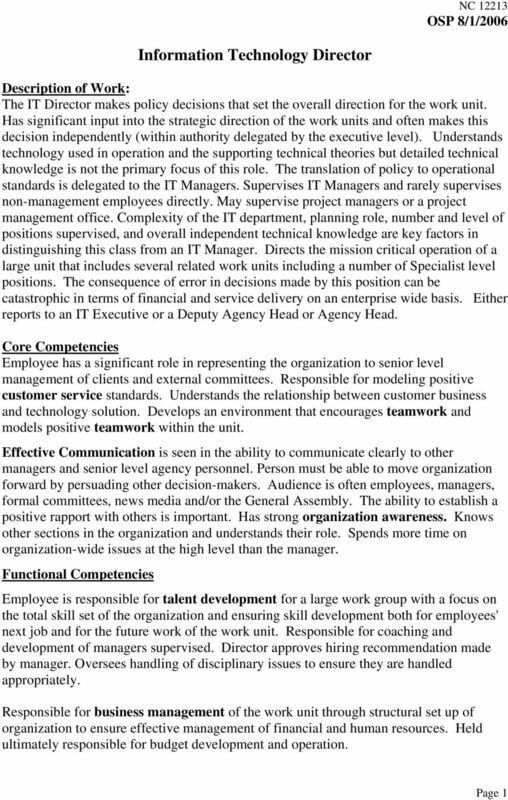 Normally supervises Information Technology Director (s) or multiple IT Managers. 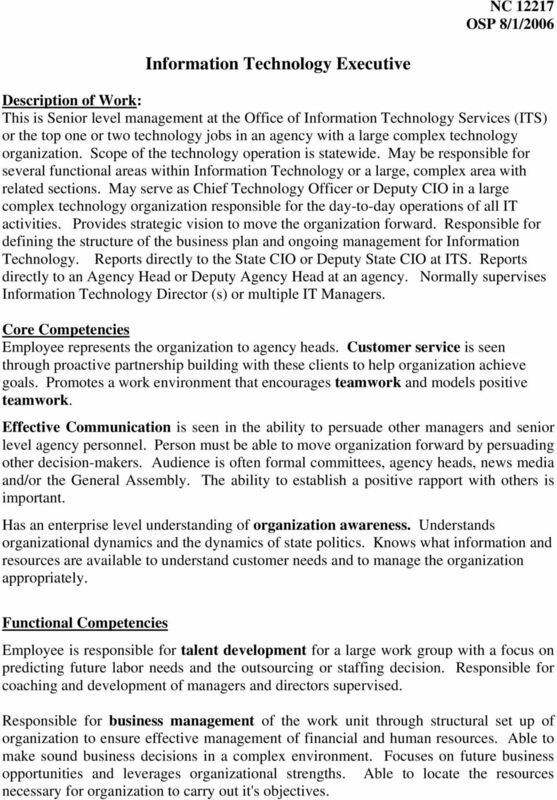 Core Competencies Employee represents the organization to agency heads. Customer service is seen through proactive partnership building with these clients to help organization achieve goals. Promotes a work environment that encourages teamwork and models positive teamwork. Effective Communication is seen in the ability to persuade other managers and senior level agency personnel. Person must be able to move organization forward by persuading other decision-makers. Audience is often formal committees, agency heads, news media and/or the General Assembly. The ability to establish a positive rapport with others is important. Has an enterprise level understanding of organization awareness. Understands organizational dynamics and the dynamics of state politics. Knows what information and resources are available to understand customer needs and to manage the organization appropriately. Functional Competencies Employee is responsible for talent development for a large work group with a focus on predicting future labor needs and the outsourcing or staffing decision. Responsible for coaching and development of managers and directors supervised. Responsible for business management of the work unit through structural set up of organization to ensure effective management of financial and human resources. Able to make sound business decisions in a complex environment. Focuses on future business opportunities and leverages organizational strengths. Able to locate the resources necessary for organization to carry out it's objectives. 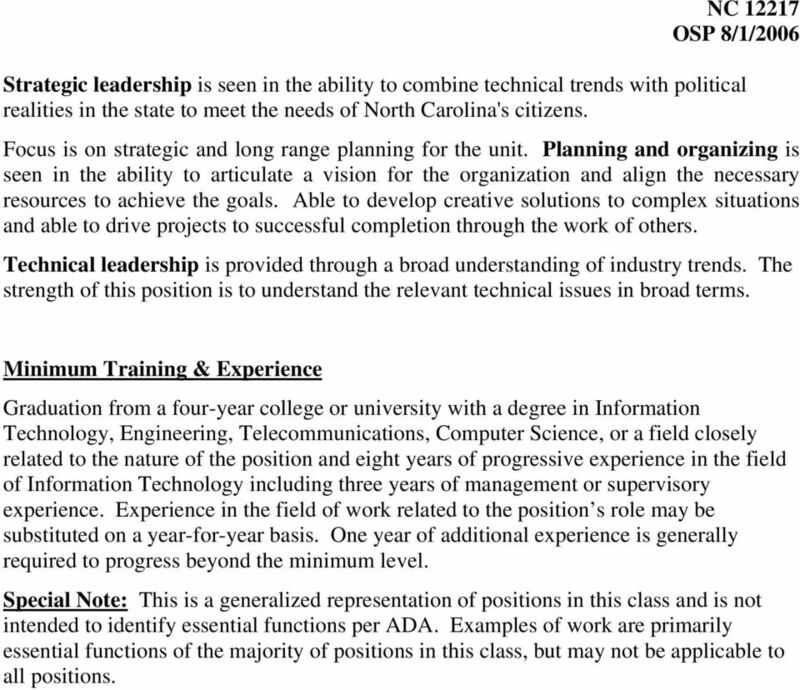 18 NC OSP 8/1/2006 Strategic leadership is seen in the ability to combine technical trends with political realities in the state to meet the needs of North Carolina's citizens. Focus is on strategic and long range planning for the unit. Planning and organizing is seen in the ability to articulate a vision for the organization and align the necessary resources to achieve the goals. Able to develop creative solutions to complex situations and able to drive projects to successful completion through the work of others. 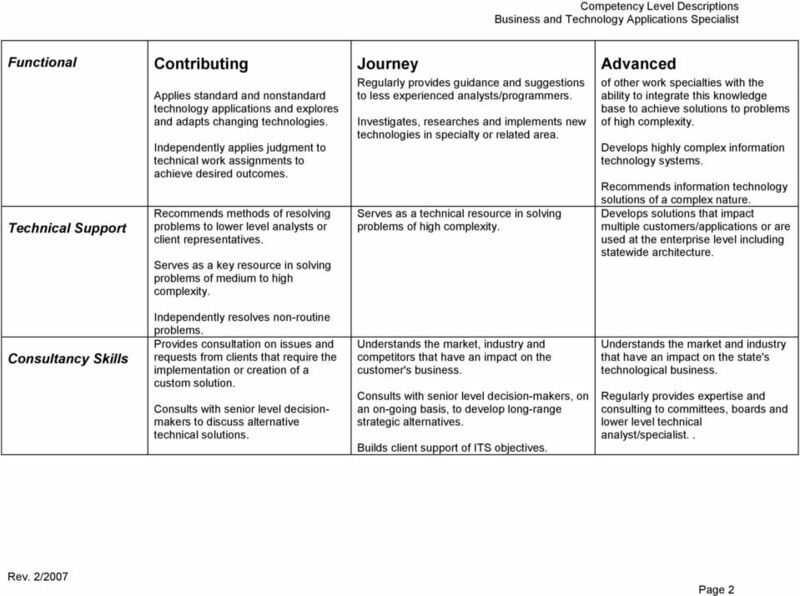 Technical leadership is provided through a broad understanding of industry trends. 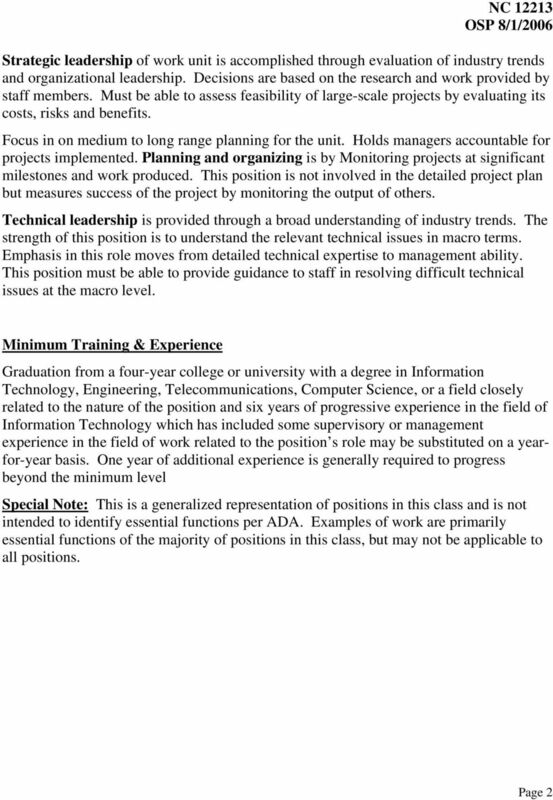 The strength of this position is to understand the relevant technical issues in broad terms. Minimum Training & Experience Graduation from a four-year college or university with a degree in Information Technology, Engineering, Telecommunications, Computer Science, or a field closely related to the nature of the position and eight years of progressive experience in the field of Information Technology including three years of management or supervisory experience. Experience in the field of work related to the position s role may be substituted on a year-for-year basis. One year of additional experience is generally required to progress beyond the minimum level. Special Note: This is a generalized representation of positions in this class and is not intended to identify essential functions per ADA. Examples of work are primarily essential functions of the majority of positions in this class, but may not be applicable to all positions. 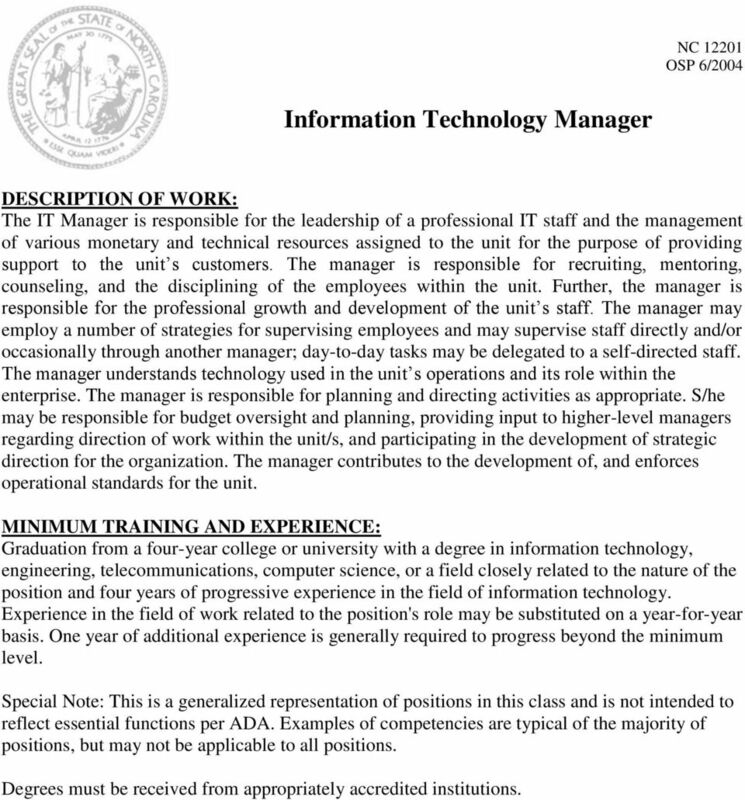 19 NC OSP 6/2004 Information Technology Manager DESCRIPTION OF WORK: The IT Manager is responsible for the leadership of a professional IT staff and the management of various monetary and technical resources assigned to the unit for the purpose of providing support to the unit s customers. The manager is responsible for recruiting, mentoring, counseling, and the disciplining of the employees within the unit. Further, the manager is responsible for the professional growth and development of the unit s staff. The manager may employ a number of strategies for supervising employees and may supervise staff directly and/or occasionally through another manager; day-to-day tasks may be delegated to a self-directed staff. The manager understands technology used in the unit s operations and its role within the enterprise. The manager is responsible for planning and directing activities as appropriate. S/he may be responsible for budget oversight and planning, providing input to higher-level managers regarding direction of work within the unit/s, and participating in the development of strategic direction for the organization. The manager contributes to the development of, and enforces operational standards for the unit. MINIMUM TRAINING AND EXPERIENCE: Graduation from a four-year college or university with a degree in information technology, engineering, telecommunications, computer science, or a field closely related to the nature of the position and four years of progressive experience in the field of information technology. Experience in the field of work related to the position's role may be substituted on a year-for-year basis. One year of additional experience is generally required to progress beyond the minimum level. Special Note: This is a generalized representation of positions in this class and is not intended to reflect essential functions per ADA. 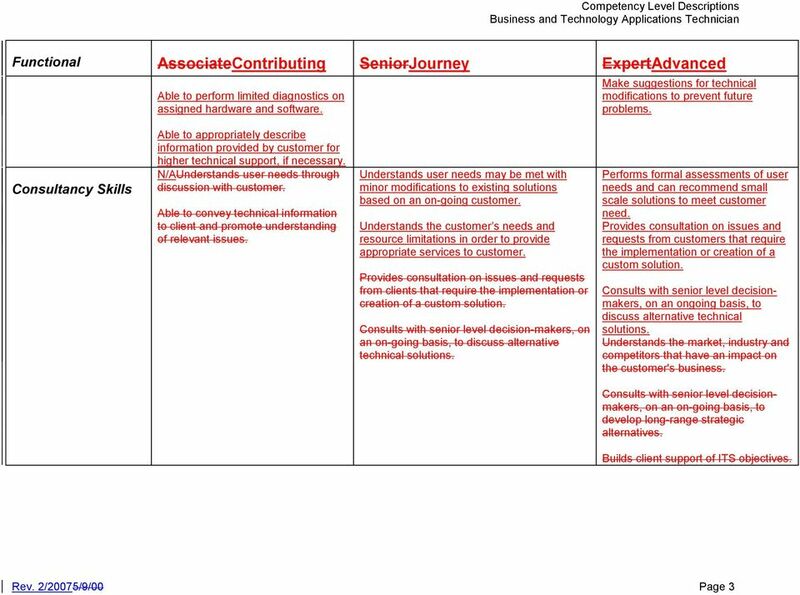 Examples of competencies are typical of the majority of positions, but may not be applicable to all positions. Degrees must be received from appropriately accredited institutions. 26 Operations & Systems Analyst NC OSP 6/2004 DESCRIPTION OF WORK: This is analytical work in the administration or operation of computer(s) or groups of computers, troubleshooting and improving operation systems, and monitoring the usage and workload of the computer systems and auxiliary equipment. 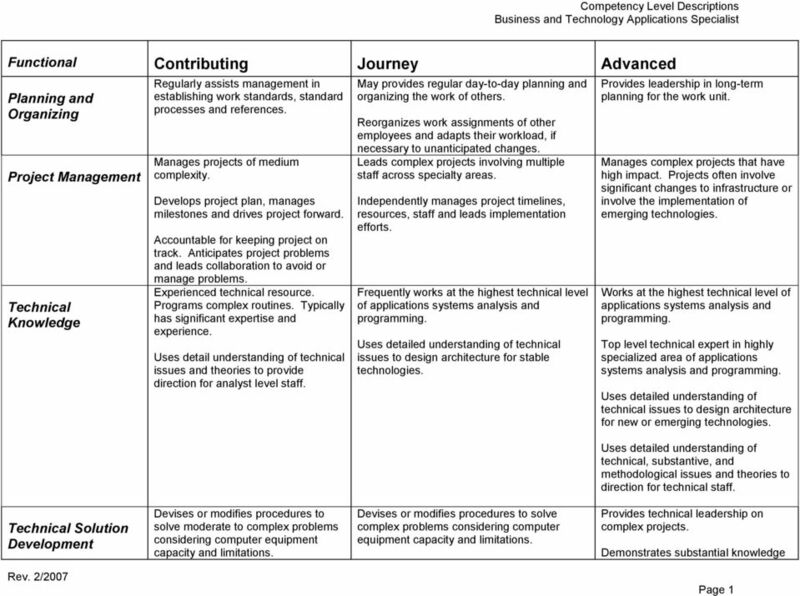 Operational procedures of computer applications are analyzed to determine potential for automation to improve efficiency or correct recurring errors. Problems with operational functions and application performance are analyzed to determine when situations require changes or enhancements to be designed, tested and implemented. Updates to operational software or new utilities to optimize system performance are installed requiring analysis of impact to existing computer systems and languages and other applications. Overall system functions are reviewed for performance failures, slowdowns, and space shortages and corrective actions are determined. This may involve tuning of existing functions within the computer operational systems or determining new products or changes from vendors to alleviate situations. 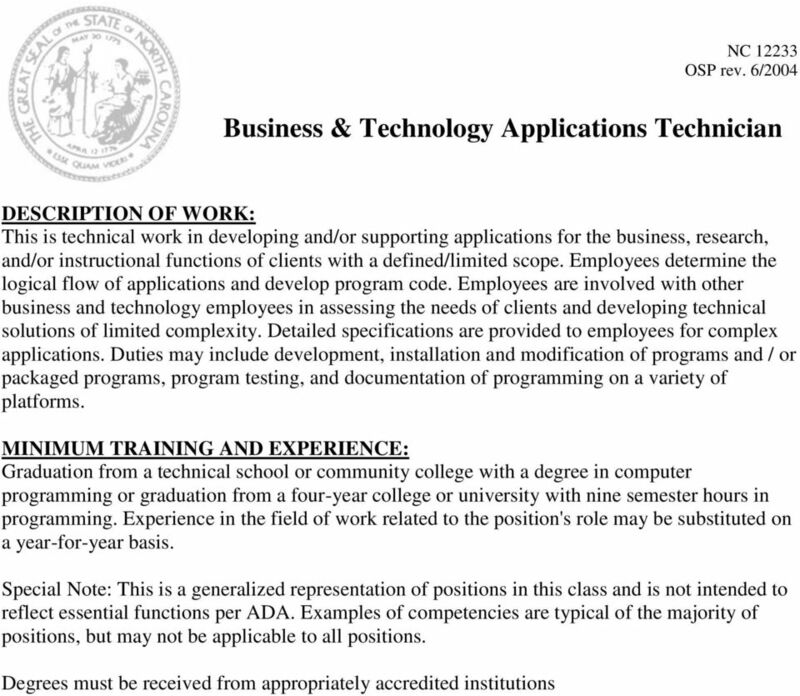 MINIMUM TRAINING AND EXPERIENCE: Graduation from a four-year college or university with a major in information technology, computer science, or a closely related field. Experience in the field of work related to the position's role may be substituted on a year-for-year basis. Special Note: This is a generalized representation of positions in this class and is not intended to reflect essential functions per ADA. 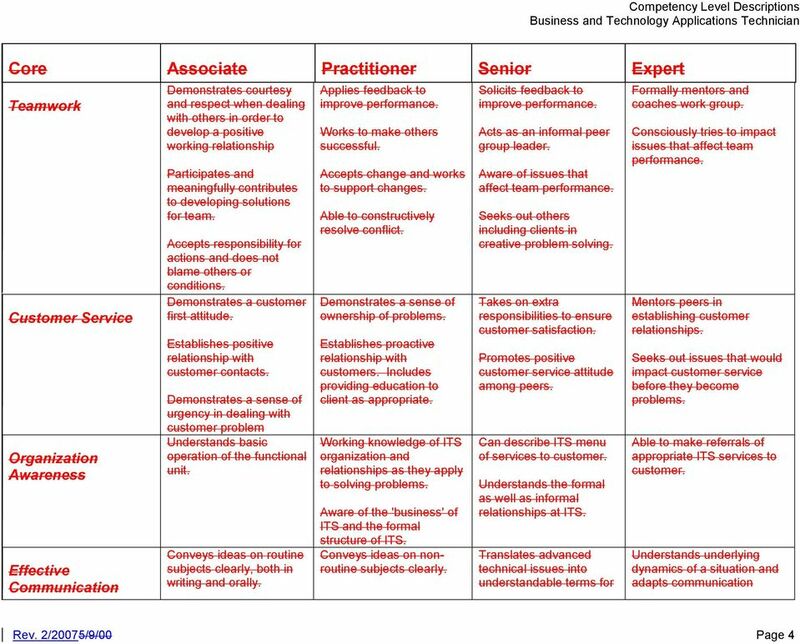 Examples of competencies are typical of the majority of positions, but may not be applicable to all positions. Degrees must be received from appropriately accredited institutions. 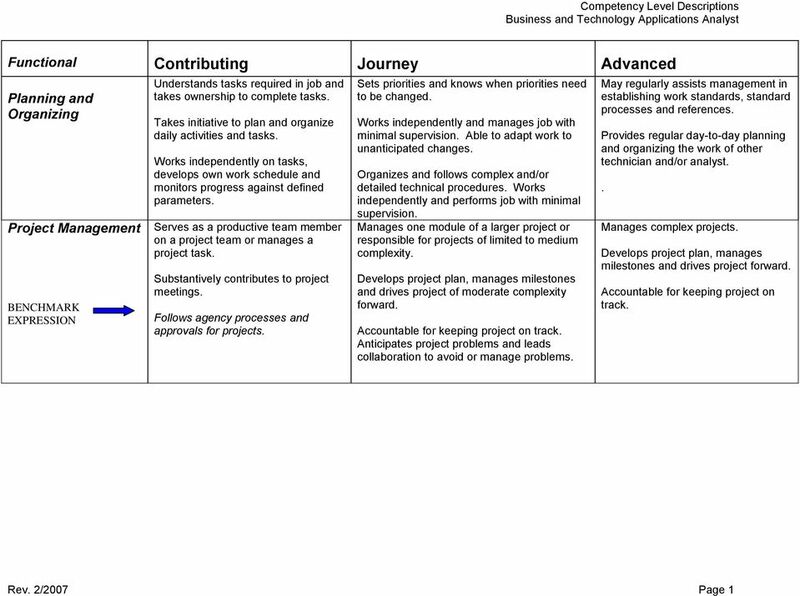 Position Descriptions include the current benchmark job description used by participants to facilitate job matching. 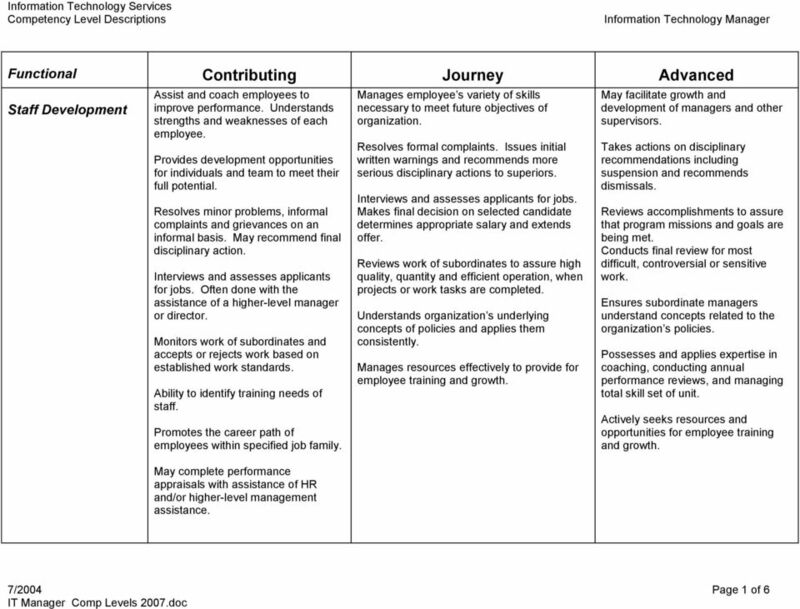 Position Summary Goals and Worker Activities 40% A. Manage the Data Center Planning and Operations Section.